I feel a flutter of excitement. This is one of my favorite cards. As a ‘ten’, it carries the energy of transition to something new, a transforming event. The ten of cups is all about community, working in community for a common purpose, being able to experience and celebrate the fruits of that effort, and then together honoring the ‘source’ that provides nourishment for this effort. The story of this particular Motherpeace card is of a community praying together for the rains that will bless their crops. It evokes in me the feeling of harvest, the feeling of the farmer’s market, and ultimately the feeling of gratitude for having access to and being able to support the local farms in this area where I live. I am now thinking about my lunch yesterday. 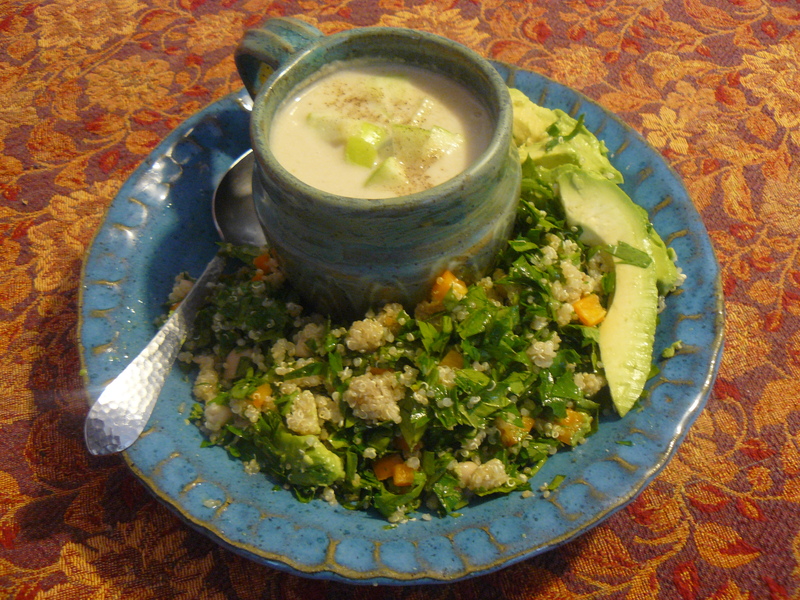 A cup of celery root soup, quinoa tabouleh, and slices of perfectly ripe avocado…. The soup is from a recipe that I find alongside a basket of celery root (or celeriac) at Sunset Farm’s market stand, in turn downloaded from Oprah.com, of a recipe from The Conscious Cook by Tal Ronnen. I also walked away with two large bunches of fresh parsley, with a feeling of ‘this is the last of the season’, and was also surprised to find more of the sweet little orange ‘yummies’ peppers at Atlas Farm alongside the fresh firm onions that are now coming in abundance. It takes four days before this meal comes to fruition. The ‘Celery Root Soup with Granny Smith Apples’ is made by sauteing 2 medium celery roots, peeled and chopped into 1″ pieces, 2-3 stalks chopped celery, 1 large onion chopped and some sea salt in 3 tablespoons olive oil in a large stockpot over medium heat. When soft but not brown, about 8-10 minutes, add 2 quarts vegetable broth (I used water with about 3 tablespoons Braggs liquid aminos since I didn’t have any broth on hand) and a bay leaf, bring to boil, reduce heat, cover and simmer for 30 minutes. Add 1 cup of thick cashew cream (made by blending in a blender cashews that have been soaked for at least 4 hours with water to make a thick paste) and simmer for 10 more minutes. Run the whole mix in batches through the blender (careful with the hot liquid exploding out the top of the blender! best to cover the lid with a towel to avoid a mess), add fresh ground black pepper and serve with finely chopped granny smith apples spooned in the center of each serving. Delicious!!! The tabouleh is simply and equal mix of cooked quinoa and chopped fresh parsley. For this batch I add some of the orange peppers finely chopped and about 1/4 cup of the leftover canned cannelli beans in the fridge, also chopped, and a tablespoon or two of fresh chopped red onion. The dressing is simply olive oil, fresh squeezed lemon juice and sea salt to taste, added with the idea that it should be enough to just lightly coat all the ingredients. The sliced fresh avocado speaks for itself. I simply sprinkle with more fresh lemon juice and a tad of sea salt. All to say, I am acutely aware of the balance in this meal between what I have ‘harvested’ from my own community and what I have ‘harvested’ from the global market. I actually don’t know where the quinoa is from as I bought it in bulk, the avocados are from Mexico, the olive oil from Italy, the lemons from Florida, the beans from a can of 365 brand Whole Foods organic beans prepared and packed in the US, and the celery and cashews are purchased at Trader Joes but I’m not sure where they actually come from. There is a certain kind of gratitude that comes with this awareness. Having access to products prepared outside my community offers me connection to all the persons involved in the process of this preparation. Having access to products grown in my own community connects me not only to the people involved in this endeavor, but also to the very land I am part of on a day to day basis. Having a balance between the two feels important. 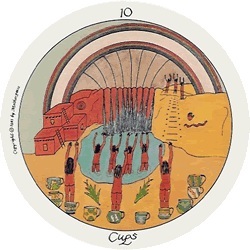 And the ten of cups reminds me that it is all good, that celebrating how we are all connected can come in many forms and feel good in many ways…..